KEEPING THE MEMORY ALIVE! 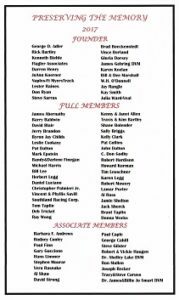 The dedication and generosity of our Hall of Fame Club members helps to ensure the Greyhound Hall of Fame can meet the obligation of “Preserving the Memory” of this great sport and maintaining the national showplace of the greyhound. We recognize the importance of your membership in our small yet exclusive club. It helps us to continue to document and display the history of the sport and to personally honor those who played a notable part in its development. We appreciate the continued investment from members. Through your membership dues, you help in keeping the memory of Greyhound Racing’s immortals, both human and canine, alive! The response and participation of the Hall of Fame Club members has been great. After initial registration, a letter of acknowledgement and a commemorative pin will be mailed to you. We encourage and welcome new members. Additional enrollment upgrades are available by calling the Hall of Fame at 1-800-932-7881. Thank you for your consideration, continuing support and dedication to the Greyhound industry as well as the Hall of Fame. Please help us meet our annual operation’s budget goal of $20,000. Currently, $10 has been raised of our $22 needed. Will you help us raise the $12 needed by joining the Hall of Fame Club?